With the Adjust vertex colors dialog you can fine-tune the vertex colors of the selected vertices or faces. Adjust HSV (Hue, Saturation, Value): As the names say. 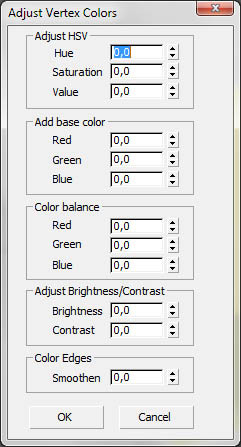 Hue values from -180 to 180 degrees, the other from -100 to 100. Add base color: Adds or subtracts a base color to or from the selected verts. Color Balance: As the name says. Adjust Brightnes/Contrast: As the names say. Smoothen: This smoothens hard vertex color borders in the selected verts. The calculations are done top-down, which means that first HSV is calculated, then base color, then color balance etc. If you want another sequence, you'll have to use this dialog twice or more.